Can the Apple Watch translate medical data to shareholder profits in AAPL stock? It’s become increasingly clear over the past few months that Apple (NASDAQ:AAPL) can no longer rely on the iPhone alone. That realization initially tanked Apple stock, which dropped nearly 40% between early October and late December. Of late, however, investors have become more comfortable with that pivot: AAPL stock already has gained nearly 20% so far in 2019. The bull case for Apple stock, as Luke Lango argued this month, is that services revenue can offset hardware pressure. With Apple stock still cheap (it trades at less than 15x forward earnings), even modest growth is enough. Add in the fact that Apple still has more cash on its balance sheet than any company in history, and it doesn’t take smashing success for AAPL to move higher. The bear case, which I laid out in detail last year, is that the iPhone simply is too important. The product still drives 60% of revenue. And with Apple’s market capitalization nearly $900 billion, what would be a hit for another company barely moves the needle for Apple. The Apple Watch is an interesting microcosm of that bull/bear debate. And news this week of a landmark study involving the product adds an intriguing layer to the argument. From one standpoint, the Apple Watch could be a key part of the transformation of Apple and AAPL stock. From another, it hardly matters at all. On Monday, researchers from Apple and Stanford Medicine released the results of a massive study involving the Apple Watch. Some 419,000 subjects participated over eight months. Those individuals wore the target smartwatches with the capability to detect abnormal heartbeats. The results aren’t conclusive. Roughly 0.5% of the participants received notice of an irregular pattern. Unsurprisingly, the rate was higher in older patients. Of those who received a notice, only about 20% followed up by wearing a patch to confirm the diagnosis. Of that group, 34% received a confirmed diagnosis. 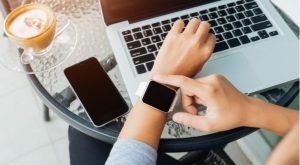 But in a smaller group of subjects who wore both a patch and the Apple Watch, 84% of atrial fibrillation cases detected by the path were also picked up by the Watch. On the whole, the study does seem like good news for Apple (and for patients). There are concerns about false positives from the technology. However, the innovation is constantly improving and will benefit from further tweaking. As one cardiologist told CNBC, the results were “moderately good for a screening tool, but not amazing.” That description could change over time, and more studies should give a better understanding of just how effective the Apple Watch is. The study doesn’t prove that the Apple Watch can be a successful cardiac screening tool, at least not yet. A two-in-three false positive rate might be too problematic for some (or most) doctors. But at the least, the study does show that Apple might be on the right path in terms of developing life-saving — and profitable — technology. Does It Matter for AAPL Stock? From an investment standpoint, the question is whether even success here is enough. Again, this is a nearly $900 billion company. Fitbit (NYSE:FIT), whose smartwatch category the Apple Watch has taken over, has an enterprise value well under $1 billion. Apple hasn’t broken out its smartwatch revenue. But sales of “other products” — including Apple Watch, AirPods, Apple TV, Beats and other smaller lines — in fiscal year 2018 were $17.4 billion, according to the 10-K. CFO Luca Maestri last year said AirPods and Apple Watch combined were driving over $10 billion annually in revenue. That’s a big number. But the revenue from other products (now called “Wearables, Home and Accessories”) still is about 7% of trailing-twelve-month revenue after driving 8.7% of first-quarter sales. Assuming its smartwatch revenue is $7-8 billion (roughly half of that category), it still drives maybe 3% of total corporate revenue. Even modest declines in iPhone revenue will more than offset growth in the Apple Watch. So it’s easy perhaps to argue that the smartwatch division simply isn’t enough. But where the story gets interesting is not just in hardware sales, but how the company can monetize the services side of the product. Healthcare giant Johnson & Johnson (NYSE:JNJ) is joining in the next controlled study of the Apple Watch. And the product itself could be the tip of the spear in the company’s healthcare strategy. Back in January, Dana Blankenhorn detailed that strategy and the ways in which AAPL stock could profit from healthcare services. Monitoring revenues could be large. DexCom (NASDAQ:DXCM) is a $13 billion company built off the back of a continuous glucose monitoring system for diabetes. Other tech giants, including Alphabet (NASDAQ:GOOG, NASDAQ:GOOGL), are looking to profit from the intersection of medicine and technology. However, the Apple Watch puts the company into millions of homes, a huge head start. I still question whether it’s enough. Even the development of a DexCom-sized business adds less than 2% to Apple’s market capitalization. But combined with efforts elsewhere in services, in content, and through share buybacks, there’s an argument that Apple can keep profits intact in the near-term before eventually driving growth again. That’s the strategy needed to keep AAPL stock moving higher, particularly with the year-to-date rally. How investors view the potential of the Apple Watch given recent developments might show how they will view the possibilities of Apple’s larger pivot away from its reliance on hardware … and just how successful that strategy is going to be. As of this writing, Vince Martin has no positions in any securities mentioned. Article printed from InvestorPlace Media, https://investorplace.com/2019/03/apple-watch-means-aapl-stock/.